McDonalds has a new holiday promo! 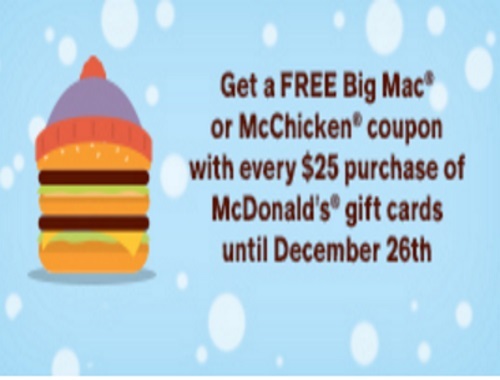 Get a Free Big Mac or McChicken coupon with every $25 purchased on McDonalds gift cards! Offer is valid until December 26, 2016. Free sandwich may be redeemed at time of purchase or you can request a coupon for use at a later date. No coupon is required for this, just ask the cashier when ordering to ensure that they are participating in this offer.